Not to be confused with the Eggrobo badniks. The Eggrobo is Dr. Eggman's final machine in Sonic Lost World, designed similarly to the Death Egg Robot. 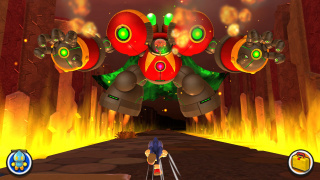 Charged up from the life energy of Sonic's world that Eggman and the Zeti plundered from the Lost Hex using the Extractor, Sonic pursues this giant machine through the burning canyons of Lava Mountain in a battle similar to the Nega-Wisp Armor from Sonic Colors. The Eggrobo does not have an official name. The mech's model is named "boss8_obj_eggrobo" in the final level's files. Palm Blaster: The floating hands of the Eggrobo fire out streams of green energy bullets. Sonic must stay in between the two streams. Once Eggman has been hit a couple of times, these streams become wavy rather than straight. Palm Beam: Scrolling laser beams fire out from the mech, and strafe across Sonic's highway. These must be jumped over with the spin attack. Again, the pattern changes up once the Eggrobo has been damaged: the lasers strafe much faster. Palm Crush: The levitating hands fly parallel to Sonic and try to squash him. Again, spin attack above the hands' grasp to dodge. Shin Opening: Having dodged the previous three attacks, Sonic is close enough to launch a homing attack on the mecha's leg. This will lead the Eggrobo's arm to drag along the highway, allowing for another series of homing attacks, finally on Eggman's cockpit. When the Eggrobo tumbles afterwards, Sonic can unleash a charged Homing Attack to deal a lot of damage and end the fight sooner. Super Sonic cannot be used for this fight. Lightning Blaster: One of the floating hands of the Eggrobo fires out a plasma beam based on the Ivory Lightning and Cyan Laser, which is avoided by moving out of the way. As he takes more damage, he will fire from both palms. Burst Fireball: The mech raises its arms in the air, flinging Red Burst-influenced fireballs at Sonic that are avoided by sidestepping. Once the Eggrobo has received enough damage, Eggman will toss a larger fireball which he combines with the Indigo Asteroid; upon landing, it'll create a black hole that will instantly kill Sonic if he comes close to it. Drill Arms: The mech's hands utilise the Yellow Drill to drill into the terrain, causing rocks to spike out from the ground that Sonic must maneuver around. After dealing enough damage, the drills will launch rolling boulders influenced by the Gray Quake at Sonic. Opening: Having dodged enough attacks, Sonic is close enough to launch a Homing Attack, but initiating the attack is a little different in this version, as Sonic must lock-on to the arms, the legs and the chest at the same time to be able to reach Eggman's cockpit. When the Eggrobo tumbles afterwards, Sonic can unleash a charged Homing Attack to deal more damage. As the fight draws closer to the end, the mech will drop Wisps which will encase Sonic in a shield made from the stolen life energy. Eventually, Sonic will launch a final attack on the Eggrobo, and the player is prompted to mash as fast as they can to successfully destroy the mech and end the fight. Unlike the Wii U/PC version, Super Sonic can be used in this fight, but Sonic will de-transform for the final attack. By defeating the Eggrobo in this version of the game, the player can gather Bronze, Silver or Gold Material based on their rank.